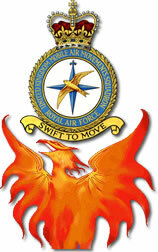 I recall the time I was working at MoD in Whitehall, in Movements Operations (RAF). It was during the Cyprus crisis of 1974 - we had been working for over 24 hours arranging the evacuation of British dependants when the Prime Minister told us to double the size of the airlift! Anyway, earlier that morning, 2 or 3 o'clock, we had made the arrangements to make Archbishop Makarios "disappear" We had a helicopter bring him from Nicosia to Akrotiri where an Argosy was standing by to take him to Luqa - all the arrangements worked out just fine and he was summarily vanished, literally, into thin air. At lunchtime that same day, I headed off to Garvey's, a favourite sandwich spot, and the newspaper boys on the corners were displaying headlines that read "Makarios Kidnapped! Whereabouts Unknown!" I had to bite my tongue - in my mind I was screaming "I know where he is!" heh heh heh. We had a closed circuit television connection with all of the major Ops rooms throughout MoD, and several times a day we would tune in for "Prayers". The Prime Minister was on too - only in voice though, there was no image from Number 10. It was hilarious sometimes, as the PM would ask a question of say, the Army Ops, and they would fumble and 'ummm ummm, well, let's see, I really think that comes under the Navy or RAF management blah blah blah' - just avoiding the whole thing because they did not have an immediate answer! We would also get SitReps over the same system - showing the different lines of battle and explaining who was shooting who etc.. My boss, Squadron Leader John Wilkinson, had a villa on Cyprus, and so he would very carefully follow the daily reports, watching the front line creep towards his villa. One morning it had happened - his home away from home was well and truly located in enemy territory - he was devastated! About an hour later, there was a report over the system that a donkey was walking down the beach with what appeared to be a grand piano on its back. Squadron Leader Wilkinson screamed "That's my bloody piano!" All of us in the Ops room just laughed so damn hard - we all had tears in our eyes! As a footnote, I never did find out if the report of the donkey was factual or just a set-up. As an aside, it was in this office that I saw the very first fax machine - way back in the mid '70s. There was a cylinder affair, similar in size and appearance to Thos. Edison's first phonograph recording machine. The page to be transmitted was wrapped around the cylinder, and a manual telephone connection was made. As far as I recall, there was only one other machine - at Upavon. Once we had chatted to whomever on the other end, the receiver was placed into a modem cradle, the cylinder started to spin and transmission commenced. The actual time taken for one page was in excess of five minutes - accompanied by a lot of whirring noises. This was real cutting edge technology in those days. Kevin Briggs, who hails from Edenbridge in the UK, is staying with Willie Crossley in Whitby, Ontario, for a few days. He made a comment in the OBA Guestbook about how cold it was over here. I sent him a note via Willies ICQ which read, "I trust your stay with Willie is a pleasant one - just don't let him talk you into employing the 'buddy system' to keep warm at night!!" Just to let everyone know, I have now handed over the membership secretary's job to Gid Wych. You can contact him at Lyneham on ext. 7405 with any queries on your memberships or by e-mail to membership@ukmams-assoc.fsnet.co.uk Gid is more than ready to accept your renewals or applications to join. Don't forget you can also contact Clive Bishop, the editor of Team Brief, with all those articles that you have been meaning to write but never got around to putting pen to paper. Any article, no matter how short, is always appreciated. Just calling in to say that I have made contact with your site. Impressive. I shall start surfing. U can teach an old dog new tricks. Mike Slade (pboh) would be well pleased with this latest development. He is probably watching from up on high. I was with UK MAMS in its infancy with the likes of Charlie Cormack and Gordon Spiers (pboh) so I'll search the attic and see what I can dig up, but please do not hold your breath. And so another "Boyo" is welcomed to the fold! Dave Greaves served in Air Movements Akrotiri in the late '60s and early '70s - he joins the OBA from St. Neots in the UK - Welcome! We are in Mrs. Kensky's 6th & 7th grade Social Studies (Geography) class,in Bethel Park Pennsylvania, U.S.A. We are about 20 minutes from Pittsburgh,Pa. 1) E-mail us and tell us your location so that we can plot it on our world map (City/Town,State/Province,Country). 2) Forward this letter to AS MANY PEOPLE AS POSSIBLE!! (even if they live in the same town as you or in another country). The word "Khormaksar" might send a shudder up your spines - it was all a part of British Military History which some might choose to forget. So many of us were involved with that corner of the Middle East, and yet there is very little on the web to tell the tale - until now. Although the page is still under construction, it is well worth a visit - there are some remarkable photographs in there, including an aerial shot of Muharraq during the Aden withdrawal that features 12 Hercs, 7 Argosys, 6 Britannias, 1 Belfast and 1 Canberra. Also in there is a fabulous aerial shot of 3 Beverleys on the ramp at K'sar, and one of a Britannia that didn't quite make it and overshot the runway. I am in the process of receiving more material and will keep you posted as to the work in progress. In the meantime, be sure to visit the Articles page and check it out. Why don't you ever see the headline "Psychic Wins Lottery?" Why is it that to stop Windows 95, you have to click "Start"? Why is lemon juice made from artificial flavouring, and dish washing liquid made with real lemons? Why is the time of day with the slowest traffic called the rush hour? Why is the word "dictionary" in the Dictionary? Well, that's it for this week. If any of you have stories from Khormaksar that you would like to share please do not hesitate to e-mail them to me.